Default CameraShake node in Nuke, but with a checkerboard/sequence switch to preview the CameraShake node, now with the ability to manually change the nested checkerboard format to match project settings. 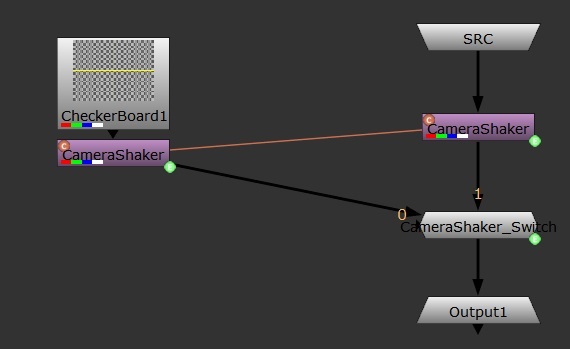 True, Nuke/NukeX does have a built in CameraShake node, but I found myself constantly setting up a node flow (shown below) to be able to switch from the source (SRC) sequence to a static Checkerboard to make quicker changes to the variables of the CameraShake node. This way, it's a little 'speedier' than Nuke or NukeX computing the probably complex nodes prior to the CameraShake node. The output dropdown box below switches between the source (SRC) sequence connected above this node and the Checkerboard. As of v1.3, you can now change the nested checkerboard format to match project settings without having to go into the group to change it. This should work within Nuke 8+ on Linux and Mac, I only have Windows to verify, so your results may vary; please leave a comment if you've tested this successfully on Linux or Mac.